Photo of bobcat taken in Ohio on May 21, 2016. Go Rufus! Everyone at Ohio University loves Rufus, yet it is amazing how few people realize that bobcats live in our backyards around Athens. 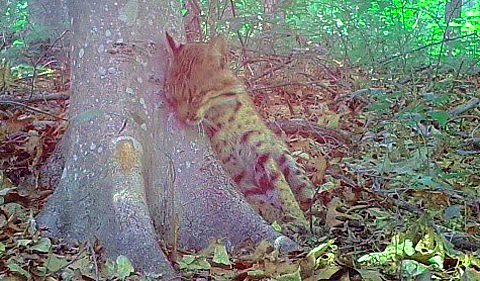 A few weeks ago, Cassie Thompson, master’s student in Dr. Viorel Popescu’s Conservation Ecology Lab, participated in the Majors Fair in Baker Center and showcased a bobcat image captured using remote camera traps in Zaleski State Forest this summer. Ohio bobcat photo taken on June 19, 2016. Mackenzie Rich puts remote camera on a tree in the Zaleski State Forest. 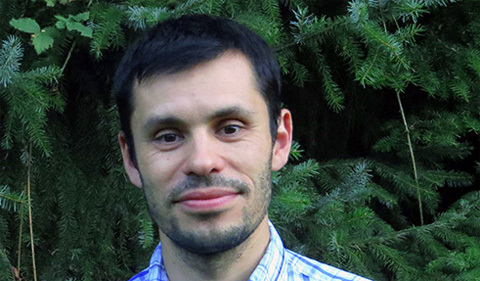 Projects in Popescu’s lab span continents, from biodiversity monitoring in China using genetic methods, to brown bear and viper ecology and conservation in Eastern Europe, conservation planning in Canada, and carnivore ecology in Sierra Nevada. 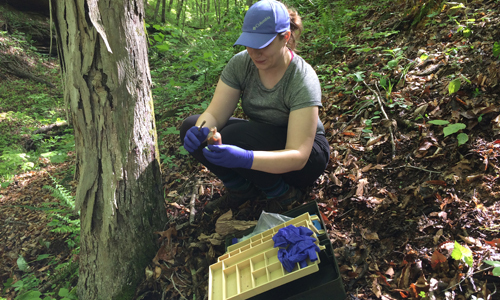 Close to home, in Ohio, ongoing graduate projects in Popescu’s lab include an evaluation of roadway impacts on box turtle populations (Marcel Weigand), investigations of climate change impacts on frogs (Thompson), and bobcat ecology and conservation research (Heidi Bencin). 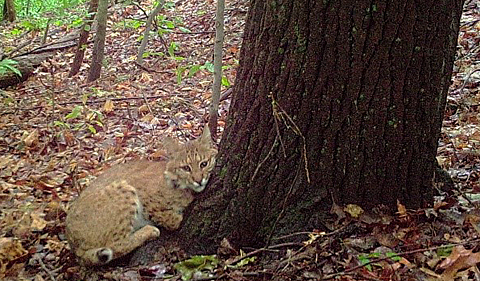 So back to bobcats… what’s so special about bobcats, and in particular bobcats in Ohio? Well, bobcats are a species native to Ohio, but they have been extirpated from the state since 1850 due to intensive trapping for fur and loss of forest habitat to farmland. After a more than a century absence, bobcats have been steadily returning home, and there have been about 200 verified sightings in 2014 alone. “This is great news for Ohio’s forest ecosystems, which have also recently expanded to Southeast Ohio, but have been lacking a top predator to regulate the food chain,” Popescu says. In addition to bobcats, black bear are slowly coming back, and the Ohio Division of Wildlife has been closely monitoring their return. Now, because bobcats are returning to Ohio, and they are a species that continues to be trapped for fur in many surrounding states (West Virginia and Pennsylvania), there is pressure from Ohio trappers to open a trapping season for the first time in about 150 years. “However, we have no clue about how many bobcats are in Ohio, if they are breeding successfully, where they are, or the speed at which they are returning,” he says. “Without such data, opening a trapping season would be detrimental for our bobcats, as numbers could plummet again if we harvest too many animals. Rich is now in the process of analyzing the data from this summer and determining what kind of habitats bobcats prefer in Southeast Ohio. Graduate student Heidi Bencin will build on this research, and continue to collaborate with Ohio Division of Wildlife to determine what portion of Ohio have the bobcats recolonized, how many bobcats are there, and how roadways, one of the major causes of mortality for bobcats, affect the Ohio population. In addition to trail cameras, Heidi will continue to use the “Chanel #5” lure to attract bobcats and collect hair samples for genetic analyses. All these pieces of information will later be integrated into a major analysis that looks at how well the bobcat population is doing in Ohio. More importantly, this research will inform Ohio Division of Wildlife on the bobcat trapping issue: how many animals can be trapped, and where, to ensure a sustainable population (of course, in case a bobcat trapping season is approved by the Ohio legislature). This late spring while driving out our drive, we observed a mom bobcat and three babies. We have a male and female regular’s on our road. Hi Donald, thanks for the update. We would love to know the area where you sighted the mom and kittens. We are gearing up for a State-wide bobcat project next year. Thank you! The farmer (Ted Kennedy), that owned the land I now have in Guernsey County, told me of a story of how when he was younger he went out to see why his dog was barking. It was a cat up a tree. Ted shot the cat. It was a funny looking cat. He took it to his job on the road crew and some guy from WV told him it was a bobcat. I am guessing the time frame that this happened could have been 1930-40. Just a note to say there may have been some bobcats around since the 1850’s that we did not know about. Thank you Jim, great to know about the earlier sightings. You are definitely right: there is no way to know with 100% certainty how many animals are there and where they live (this is a probably the most crucial question for wildlife management and conservation); bobcats have probably always been moving West from PA or WV, but not in significant numbers until the 70’s. Post 70’s is when a self-sustaining population started to accumulate. Do Bobcats live in urban areas? We have a “cat” living under our deck. My husband saw it at dushand said he thinks it is about as big as our dog, a 60# boxer. Hi Coleen, it is unlikely that a bobcat would have a den in an urban area, especially in such close proximity to humans. They are very shy animals, and love large bodies of forest. It is not excluded that bobcats could travel through suburban areas. Large bobcats can get to be up to 1.5 – 2 ft tall, but are light (up to 15-20 lb). You could try setting a trail camera focused on the deck to solve the mystery. I was talking with a friend a few weeks ago who is an avid outdoors man and he said he saw a Bobcat along the North Fork of Little Beaver Creek about a mile upstream from the Ohio line in Pennsylvania resting on a rock along the stream. He watched it from his truck where there is a bridge closed that crosses the creek. Hopefully Bobcats are expanding their territory. I’ll have to put my game camera up! Thanks Brad! Great to see that bobcats sightings are becoming more frequent. They are definitely expanding their range in Ohio. There are 2 distinct populations: Eastern OH, colonized by bobcats from PA and WV, which is self-sustaining, and Southern OH, colonized by animals from KY, which is still reliant on continuous immigration of new animals from KY.
ODNR does not know if these two groups of animals are mixing, so ODNR and Ohio U are getting ready to start a State-wide survey this summer to document many unknowns in their ecology and their recent expansion in Ohio. Two years ago, in Monroe County, Ohio, my grandson and I happened to see a large bobcat in a “cove” of my yard that was surrounded by forrest. I was sure I saw a bobcat, but for reassuring confirmation I asked the 4 year old what HE saw! His answer? ‘A BIG cat! The bobcat would have weighed 40 pounds easily; probably more. He literally vanished as we observed him/her. Quite a magnificent creature. That’s a great story Tom! There are definitely bobcats in Monroe County, so most likely your grandson was right. However, like with all cats, appearances can be deceiving; bobcats look (and are) large, up to 2 ft tall, but are light, only up to 20 lb. All that fluffy fur hides a very light and agile predator. They are absolutely magnificent, and we are lucky that they are making a comeback in OH.